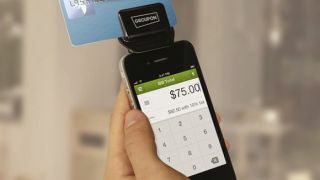 Groupon declared "the deal is on" in the crowded credit card reader business by launching Groupon Payments Wednesday, pitting the deal-of-the-day company against Square, PayPal Here, and Intuit GoPayment. The difference is that Groupon is using its deep discount philosophy to benefit the person on the other side of the counter: the merchant. Credit card fees start at just 1.8 percent per swipe and $0.15 per transaction. That considerably low rate applies to Groupon merchants only; non-merchants should budget themselves for a still reasonable fee of 2.2 percent and $0.15 per transaction when swiping a card from MasterCard, Visa, or Discover. American Express is the only credit card company that isn't in on the deal. It's charging all merchants a steep 3 percent per swipe and $0.15 per transaction. Punching customer credit card numbers in manually is also slightly more expensive: 2.3 percent and $0.15 on MasterCard, Visa, and Discover, and 3.25 percent and $0.15 on AmEx. Groupon is determined to help merchants exchange money with their customers at rock-bottom prices, going as far as to "guarantee to be the lowest cost option for the company's merchants to accept credit cards." It should be easy for the company to meet that commitment. The credit card reader competition, while plentiful, isn't close to Groupon Payments' 1.8 percent per swipe and $0.15 per transaction rate. Intuit GoPayment is the closest at 2.7 percent per swipe with no transaction fee, and yet that's more expensive than Groupon's non-merchant fee of 2.2 percent per swipe. What's more, PayPal Here is also 2.7 percent per swipe, but with a $0.15 per transaction fee tacked on. Square sits at 2.75 percent per swipe and $0.15 per transaction fee. One area in which the newly launched Groupon Payments isn't ahead of the competition is in device compatibility. So far, it's only available on the iPhone and iPod touch through the Groupon Merchants app.